Venous thromboembolism (VTE) is a complex multifactorial disease that represents a growing public health concern. Identification of modifiable risk factors at the population level may provide a measure to reduce the burden of VTE. 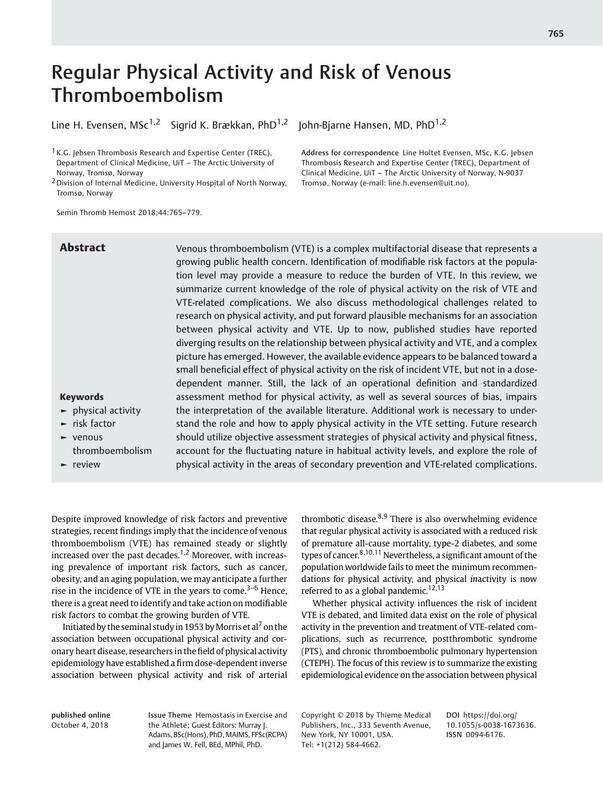 In this review, we summarize current knowledge of the role of physical activity on the risk of VTE and VTE-related complications. We also discuss methodological challenges related to research on physical activity, and put forward plausible mechanisms for an association between physical activity and VTE. Up to now, published studies have reported diverging results on the relationship between physical activity and VTE, and a complex picture has emerged. However, the available evidence appears to be balanced toward a small beneficial effect of physical activity on the risk of incident VTE, but not in a dose-dependent manner. Still, the lack of an operational definition and standardized assessment method for physical activity, as well as several sources of bias, impairs the interpretation of the available literature. Additional work is necessary to understand the role and how to apply physical activity in the VTE setting. Future research should utilize objective assessment strategies of physical activity and physical fitness, account for the fluctuating nature in habitual activity levels, and explore the role of physical activity in the areas of secondary prevention and VTE-related complications.